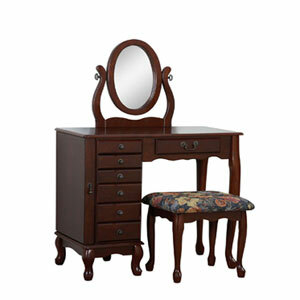 Lovely Vanity With Adjustable Mirror And Bench Set In Heirloom Cherry Finish. Features Include A Center Drawer Lined With Wipe Clean Vinyl Which Is Perfect For Cosmetics And Six Fully Lined Drawers Divided For Rings, Earrings, Bracelets, Hair Accessories And Cosmetics. The Side Door Swings Open To Reveal Hooks For Necklaces Of All Sizes And Length. The Bench Features A Fabric Seat With A Fruit And Floral Tapestry. Strong Construction. Easy To Assemble. Also Available In Nostalgic Oak Finish. See Related Items Below.